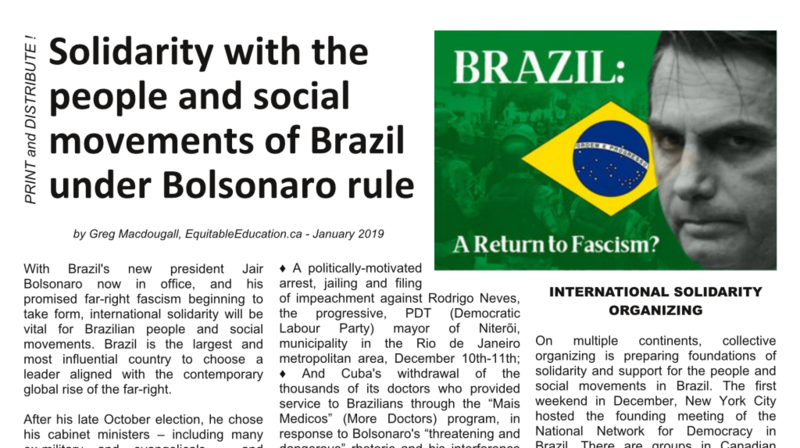 With Brazil’s new president Jair Bolsonaro now in office, and his promised far-right fascism beginning to take form, international solidarity will be vital for Brazilian people and social movements. Brazil is the largest and most influential country to choose a leader aligned with the contemporary global rise of the far-right. After his late October election, he chose his cabinet ministers – including many ex-military and evangelicals – and transformed the Human Rights ministry into the ‘Family, Women, and Human Rights’ ministry. And Cuba’s withdrawal of the thousands of its doctors who provided service to Brazilians through the “Mais Medicos” (More Doctors) program, in response to Bolsonaro’s “threatening and dangerous” rhetoric and his interference in the terms of service. Bolonaro’s statements, both during the campaign and historically, illustrate the potential dangers facing Brazil (see The Intercept‘s compilation of quote highlights). A December 21st warning statement “In support of Democracy, Human Rights and the Environment in Brazil” was endorsed by 47 prominent US-based organizations; the International Front of Brazilians for democracy and against the coup (FIBRA) also published a manifesto on January 1st. The Workers Party (PT), whose candidate Fernando Haddad finished second in the presidential election, issued a statement boycotting Bolsonaro’s inauguration, rejecting his aim “to impose a police state and tear apart the historic achievements of the Brazilian people.” On January 10th, the largest Indigenous organization in Brazil – APIB – issued a call for international solidarity, translated as “Indigenous Blood: Not One More Drop”; they also released a short video with English subtitles, and led a January 31st Indigenous mobilization #JaneiroVermelho (‘Red January’) that spanned 10 countries, 22 states, and 70 cities. On multiple continents, collective organizing is preparing foundations of solidarity and support for the people and social movements in Brazil. Two events in Ottawa featured speakers presenting context and analysis to the situation in Brazil and to the kind of solidarity support that may be most needed. Three audio recordings, each approximately a half-hour, are included here followed by accompanying written descriptions. Max Garcez, a labour lawyer with Advocacia Garcez, currently living in Ottawa. Sabrina Fernandes, who completed her PhD at Carleton University in 2017 on the Depoliticization and Leftist Fragmentation in Brazil. She is currently working at the University of Brasilia, is an editor with Jacobin Magazine, has a popular YouTube channel (TeseOnze) and a new book coming soon, Sintomas Mórbidos: a encruzilhada a da esquerda brasileira (São Paulo: Autonomia Literária, 2019). In the days following the election, Brazilians experienced and witnessed attacks on workers, Indigenous, women, and LGBT people, said Mendonça. She mentioned that the Landless Rural Workers Movement (MST) had one of their camps set on fire, and that one of Bolsonaro’s first actions had been to establish a military taskforce to classify opposition to the new regime as terrorists. Mendonça expressed that Bolsonaro is likely to influence neighbouring countries as well, while Garcez also highlighted the global climate change risk that his approach to the Amazon rainforest poses (60% of the Amazon is in Brazil). Garcez noted that the judge who sentenced former president Lula to jail this past summer, Sergio Moro, has now been appointed by Bolsonaro as Minister of Justice. Lula was the favorite to win the presidency before he was imprisoned, and Bolsonaro was provided a huge advantage with Fernando Haddad, the Worker’s Party (PT) replacement candidate, only doing campaigning for one month before the first vote. Mendonça described Lula’s jailing as illegal and political, saying there wasn’t evidence to convict him, and further pointing out that the order that kept him from communicating with the media while in jail was illegal and different treatment than for regular prisoners. Garcez emphasized how bad it will be with Bolsonaro as president, although it is unclear what’s to come. He also explained that many had previously thought Bolsonaro would be unelectable based on what he represents. Garcez said that it’s wrong to think of Bolsonaro in the same terms as Donald Trump or Ontario Premier Doug Ford, even adding that he would gladly campaign for either of them if it was against Bolsonaro! He also noted that far-right European leaders like France’s Le Pen have distanced themselves from Bolsonaro’s positions. Garcez and Mendonça did acknowledge problems exist/ed aside from Bolsonaro. For example, with the previous progressive Workers’ Party (PT) government, led by Dilma Rousseff until 2016, Garcez described his legal firm working half the day attempting to defend the Rousseff government from the impeachment/ parliamentary coup, and the other half to fight against her government’s privatization policies. Mendonça said that Rousseff had been impeached despite no evidence she was involved in corruption. When Bolsonaro voted for the impeachment, he declared to the Parliament that his vote was dedicated to the military commander of the Doi-Codi torture unit who had imprisoned and tortured Rousseff and others in the 1970s. A number of attendees at the Ottawa event were Brazilians living in Ottawa; some had family members who had voted for Bolsonaro – the majority of Brazilians in Canada do seem to support Bolsonaro. One Brazilian attendee noted the importance of international validation for the work and ideas of Brazilian activists and academics, as many Brazilians are dismissive of them. Mendonça noted the important role the international media had during the election in confirming that Bolsonaro is fascist, something not necessarily conveyed by domestic Brazilian media. One of Mendonça’s suggestions was for Canadians to research and pressure Canadian companies that have businesses in Brazil. Her visit to Ottawa was scheduled along with a Food Secure Canada conference in Montreal, where two days later she co-presented on the case of farmland grabs involving Canadian pension funds. She also emphasized that there will be a continuing need for connections and communication between activists in Canada and elsewhere with Brazilian social movements and alternative media. *It was from this Nov 1st event that the new group Ottawa-Gatineau Solidarity with Democracy in Brazil OGSDB began. There is audio (8min) of OGSDB member Karla Matias interviewed by CBC radio in advance of the January 7 action at the Brazilian embassy in Ottawa. João Velloso spoke about the ‘anti-enlightenment phenomenon’ that has emerged, where dialogue and mutual efforts at understanding are more and more futile against dominant discourse. Velloso presented a video as example, of a preacher celebrating Bolsonaro after he’d won the election. The preacher references the Bible’s Corinthians 1:27-28, “Yet God chose the foolish things of the world so He might put to shame the wise; and God chose the weak things of the world so He might put to shame the strong; and God chose the lowly and despised things of the world, the things that are as nothing” as the reason God chose Bolsonaro. Charmain Levy gave an overview of what constitutes fascism, drawing on Umberto Eco’s work (Ur-Fascism, 1995) as well as Leon Trotsky’s (Fascism, 1938) to explore how they may apply to Brazil’s situation, particularly during the election campaign. She mentioned the “Escola sem Partido” (‘Education without Party’) push to remove progressive ‘ideological’ ideas from the school system, especially in terms of sexuality and gender issues, that has been given more life by Bolsonaro; this is happening in the country where Paulo Freire’s Pedagogy of the Oppressed originated. She referenced Bolsonoro for being known as the ‘Mito’ (myth/legend), which was reinforced by his surviving a stabbing assassination attempt during the campaign, and how this fits with the non-rational and ‘symbolic’ strength of the ascension of fascism. The popularity of his ‘finger guns’ gesture also fit with the strength of symbol recognition. One primary aspect of fascism is the creation of an enemy to society: here it is the ‘communist red threat’, which does include, in this case, gays and feminists, progressive or leftist university professors, as well as those who identify with the PT party, among others. Her analysis of what contributed to his election victory consisted of four main aspects. The first was the economic problems that had beset the country, including their mismanagent by the PT party and president Dilma Roussef’s appeasal attempts to work with the centre-right opposition parties at the time. The second was the media – both the corporate/mainstream media’s agenda to attack the PT, and the very successful and heavy use of social media to spread inaccurate political information during the campaign. Third were the efforts, similar to the corporate media, of the centre-right political parties to attack and discredit the PT – not realizing that much of the public would also discard the centre-right as ‘typical corrupt politicians’ and instead support the far-right. Fourth was the role of conservatives and churches in the campaign and in the country overall – a large proportion are highly religious and many were receptive to Bolsonaro’s proposals to ‘take a leap backwards’ to a time with more traditional and prominent roles of church, family, and discipline. Levy also mentioned Bolsonaro’s ability to harness popular sentiments, such as around the country’s high levels of violence, and said she thought his presidency will continue such campaign-style communication. Sabrina Fernandes provided context and details of the situation of the leftist parties and political movements in Brazil, including the need for self-critique amongst the left. This includes how the PT could have helped build more of a public political and class consciousness while in government, whereas it wasted that opportunity and now there is a huge ‘loss of meanings’ including concepts of class struggle, democracy, the left and right, etc. Some public mis-understandings are of the Nazis as left socialists, of Marx as a satanist who practiced witchcraft, of democracy defined as a change of presidents (that it would be anti-democratic if the same president/party were voted in again). She explained how this was helped with the public discourse of Bolsonaro and the far right, with their campaigns of fake news and ‘fire hosing’ to reduce the credibility of their opponents, their bait-and-switch announcements to further support this, and the exploitation of ‘moral panics’ such as with the education system – the supposed agenda to push homosexuality and ‘gender theory’ on children – and with the communist threat. She described the context, of a military dictatorship that ended less than 40 years ago, that has not been reconciled properly for the general population to understand the dangers, and with a constitution created 30 years ago, resulting in a fragile democracy. She also explained the process of depoliticization and demobilization that has occurred with a leftist government in power. This included a reduced focus of grassroots organizing in favour of more energy simply of holding marches, that has resulted in lessened political capacity. Her analysis included the far right ‘fakenews’ and ‘firehosing’ attacks, but also the real damaged credibility of the PT from corruption and other areas where they didn’t live up to their ideals. There was also what Fernandes explained as the mismanaged election strategy and failure of the left to work together. She applied the concept of Gramsci’s “crisis of authority” (Prison Notebooks, 1929-35) along with the PT’s loss of hegemonic power, and also an updating of an early Zizek concept of “ultra-politics” (The Ticklish Subject, 2009) with respect to the relative lack of antagonism against those who oppress, exclude and exploit the masses. The buy-in of many in Brazil to Bolsonaro’s rhetoric around ‘communists’ as criminals and the need to rid society of them is something she identified as part of the troubling trajectory the country is now on – with the looming danger of the systematization of the violence and repression that has until now only been random. This article in PDF format (/11×17″) is intended as an organizing tool, to be printed and distributed at events, actions, classrooms, community spaces, and otherwise.